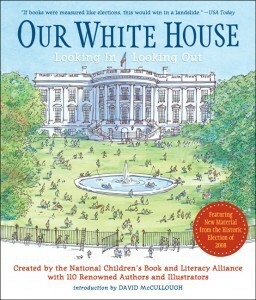 Our White House -Looking In, Looking Out is an excellent children’s book co-created by the National Children’s Book and Literacy Alliance. This informative and educational book takes an inside (an outside) look at the history of the White House. It is engaging for children because it includes a fascinating mix of poetry, art, speeches, Presidential letters and works of fiction and non-fiction. The illustrations and photographs are exceptional and really captured my son’s attention. I was very impressed with the 100+ contributions by some of our favorite authors including Jane Yolen, Katherine Paterson and Gregory Macquire. The content is engaging and held my seven year old son’s attention during our history class. He is very interested in our election process and is even accompanying me when I vote for President. Therefore, he really likes to learn about the history of the White House and reads at least one selection from this book every day. His favorite story is “A Note For the President” by Jerry Spinelli and he also loves the illustration by artist, James Ransome that accompanies “The White House By Moonlight”…..it is beautiful! This anthology, Our White House is an excellent resource for children of all ages and is perfect for homeschool families like ours who are looking for informative yet entertaining resources for history class. You are invited to visit Candlewick Press to purchase Our White House (SRP $14.99 softcover) and browse the entire selection of high quality children’s books. I also like A Foot in the Mouth! Thanks for hosting! A Birthday For Bear sounds cute! I’d love to read A Visitor for Bear. don’t think the spring 2012 books, trung, are actually books 😉 they are just catalogs containing books! I’d like A Visitor for Bear. Thanks! A birthday for bear- my nephews nickname is bear!